31st July is the last day to file your Income Tax Returns in any given financial year. The process of filing your Income Tax Returns in India takes some preparation. This is why the Government gives you four months’ window period to compile all documents like salary/income details, bank statements, previous tax statements etc. The procedure varies as per the income earned per year and income source like salary, business profit, investment profit and so on. Collating all your documents ready is just one aspect of it. 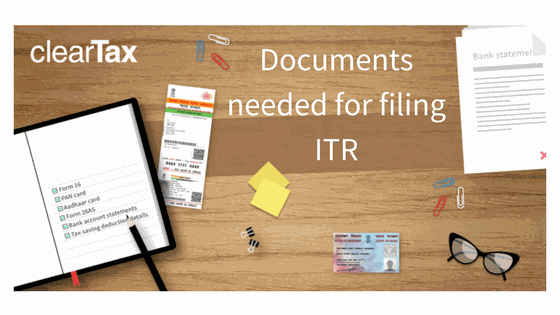 In this article, we will discuss in detail about the documents needed for filing Income Tax Returns in India. If you are a salaried employee, gather these documents to e-file your income tax returns in India. Go through this list to see the documents you’ll need to do your taxes. Did you know that Form-16 is all you need to e-file your income tax returns on ClearTax? It’s that simple really. Got your Form-16? Start e-filing. ClearTax automatically gives you tax benefit as per Section 80TTA when you enter your income from savings account interest. You won’t need all the documents listed here as they vary on a case-by-case basis. The maximum amount that can be claimed under Section 80C is Rs 1.5 lakhs. Click here to see the detailed list of all the deductions available under Section 80. To know more about how to claim deductions against your home loan, Click here. Interest paid on housing loan: Interest on housing loan is eligible for tax saving upto Rs 2,00,000. This is for a self-occupied house. For let out or deemed let out property, there is no limit of interest on housing loan eligible for tax saving till FY 2016-17. From FY 2017-18, the total loss from house property available for set off against other income is capped at Rs 2 lakhs and therefore, interest on housing loan is eligible for tax saving upto Rs 2,00,000 for let out property as well. Stock trading statement: The stock trades that were made during the year may be taxed under Capital Gain.